Tag line: "Push it to Pop it! Rock it to Lock it! Break it to Make it!" After watching the excellent documentary Electric Boogaloo: The Wild, Untold Story of Cannon Films, I was anxious to once again check out some of that studio’s more popular offerings, many of which I haven’t seen in years. 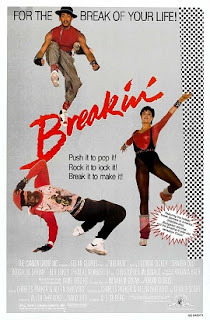 Directed by Joel Silberg, 1984’s Breakin' was one of Cannon’s most successful releases (its 1st week, Breakin’ actually outgrossed John Hughes’ Sixteen Candles, which debuted at the same time), and, what’s more, was credited with launching the decade’s breakdancing craze. I remembered liking this film when I first saw it, but is it actually a good movie, or simply good by Cannon’s standards? Kelly (Lucinda Dickey) loves to dance, but her dreams of becoming a famous jazz dancer are all but dashed when she refuses the advances of her slimy instructor, Franco (Ben Lokey). Fortunately, her friend Adam (Phineas Newborn III) had recently introduced Kelly to two street dancers: Ozone (Adolfo 'Shabba Doo' Quiñones) and Turbo (Michael 'Boogaloo Shrimp' Chambers). Despite having no experience as a breakdancer, Kelly decides she wants to dedicate her life to learning these amazing moves, and with the help of Ozone and Turbo she’s soon catching on. She even manages to impress her agent, James (Christopher McDonald, in an early screen role), who thinks he can get Kelly, Ozone and Turbo entered in an upcoming dance competition. But will her new partners agree to perform in front of judges who have no idea what street dancing is all about? Even in the ‘80s, the basic premise of Breakin’ was nothing new: its story of talented kids beating the odds to make it big had been done before (1980’s Fame leaps immediately to mind). In addition, the film fails to dot all its “I”s and cross all its “T”s (we’re led to believe early on that Kelly’s agent James is infatuated with her, but neither this nor Ozone’s perceived fear of competition are ever fully explored). What Breakin’ does have, though, is lots of dancing, some of which is extraordinary. The two dance-offs where Ozone and Turbo face off against Electro Shock (Bruno “Pop & Taco” Falcon, Timothy “Poppin’ Pete” Solomon, and Ana “Lollipop” Sanchez) are entertaining as hell, but the film’s best number starts innocently enough, with Turbo sweeping the sidewalk with a broom (a sequence so packed with energy that I had to watch it twice).